Study in Canada & you will have opportunity to encounter different culture & natural experiences within different cities such as Toronto, Montreal, Vancouver & Quebec famously friendly & multicultural. Canada is known for the natural beauty close to wealth of forest, lakes & mountains & for its multicultural diversity. Studying in Canada and getting admission of any Canadian college or University should be top priority for any those who want to pursue quality education in their respective areas and interest. 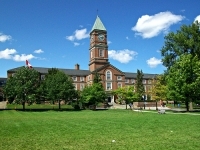 Canada has well established position among the world’s leading study destinations of 2014; it was seventh most popular country, for international students. The most popular Canadian for International students are Ontario, British Columbia and Quebec in Canada. For higher education in Canada undergraduate degrees can take either three to four years to complete depending upon the university. Graduate programs last between one to three years. Different types of education in Canada include community colleges, associate degrees or universities. The main benefit for studying in Canada is there would be no language barrier because English is the main language, its fees are comparitabilty low & colleges are highly ranked. In per class there are 25-30 students. In Canada there is variety of courses available such as business management, nursing, hotel & tourism, engineering, electrical, communication, computer science & many more. In Canada there are variety of colleges such as university of Manitoba, Humber college Institute of Technology & advance learning, Fans awe college, Capilano University, Lakeland college etc.